Thanks for everyone of you that helped us make it possible!!! 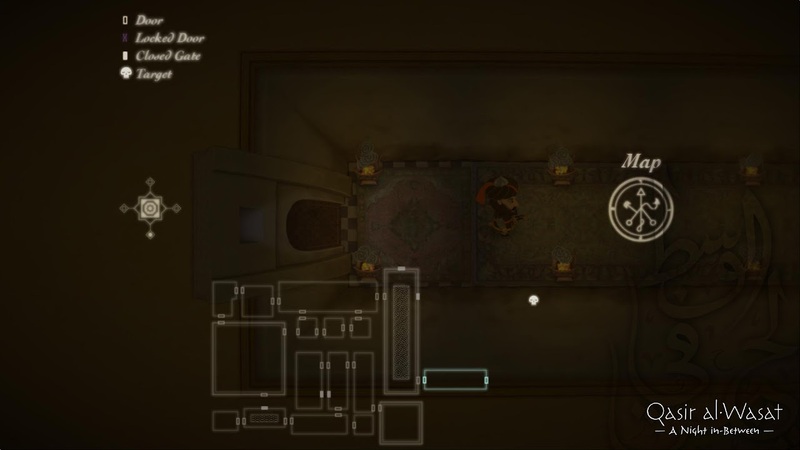 It's called Qasir Al-Wasat - A Night In-Between, a Stealth Action-Adventure where you control an invisible creature summoned to perform an assassination mission. 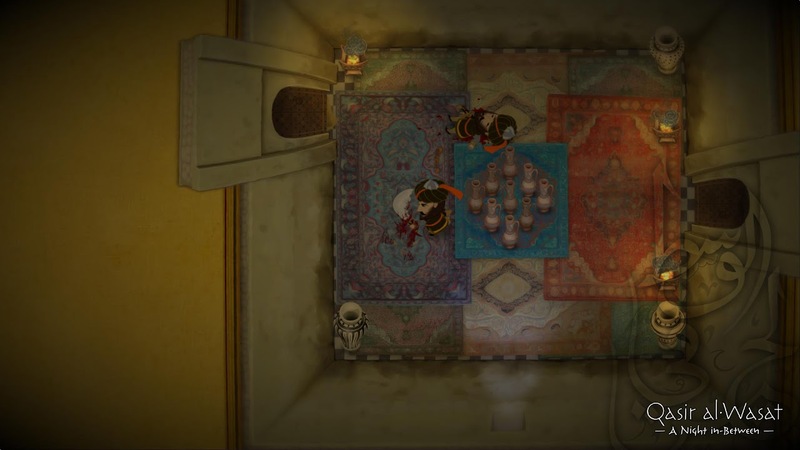 The game is settled on a fictional 12th century Syrian palace, locked in-between planes (and in-between two palaces that really existed), and evokes a Dark Arabian Nights theme. More info can be found at the game's site. Here are some screenshots (right click and view image to see them large). Thanks again to everyone that provided feedback (and feel free to keep doing it, even if you hadn't before)! 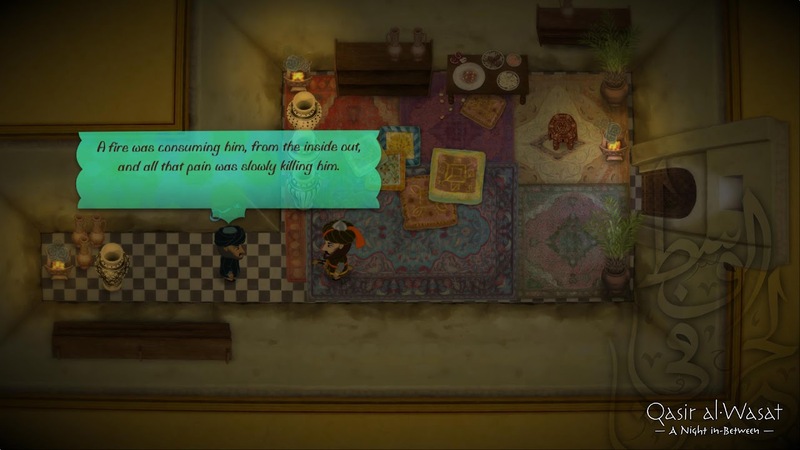 This is such a charming stealth game I'm currently testing, the dialog is well written, and there is actually a pretty in depth storyline to the character as well, I'll of course give my feedback below when I finish another full play through. I added in my report for the game. I think this one, when finished and properly bulletproofed, may be one of the best indie stealth games out there. Please inform me if you update the public beta for further testing. I would very much like to remain interested. This week I'll post here an updated build. I'm intended fix many level design issues and other stuff. Also, we'll have two mini-game puzzles, one is a dial rotation puzzle that you're supposed to match the dials to form a picture and a pipe puzzle that you need to form specific alchemic solutions out of some components and filters. I actually managed to get into the tin door via cheating where I found the basics of the said dial puzzle. I know I've already said it in my reports, but I think the puzzles might be a little bit of a waste -- especially the version I saw. Since you already have such a fine-tuned and indepth main engine, any departure that doesn't involve it feels a bit jarring; like that Towers of Hanoi that kind of comes out of nowhere in Mass Effect. 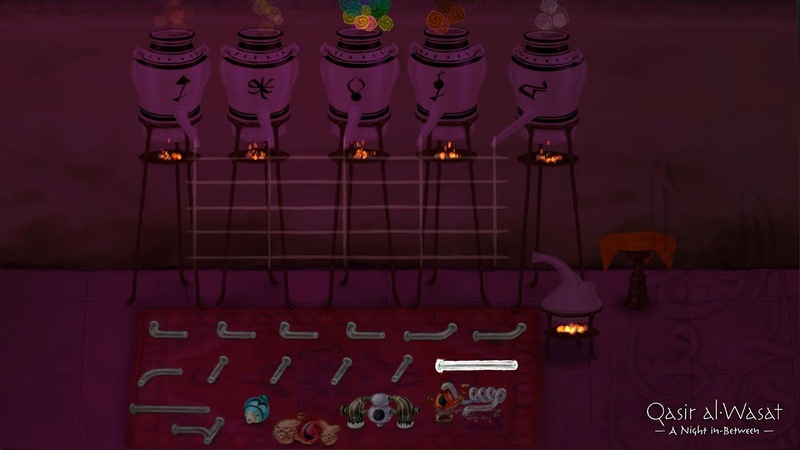 The pipe puzzle to form alchemic solutions sounds a bit more promising, if only because the notion of alchemy has a theme in the game. However, I wouldn't make it a "cut to puzzle" thing. I would actually involve the game engine a bit more with it, including carrying vials of specific alchemic substances from one room to another while avoiding guard detection, only you can't place them on the floor otherwise the glass would break. ... Hrm... Right now it's pretty possible to speedrun up to the final target in less than 15 8 minutes, sometimes without even a single triple alert from an armed guard. (The only one where you can come close is the one with the cutscene before it. You can get around by ESC'ing out of the cutscene, using a poison attack on the left facing guard, and carrying the key around.) (Also, when I do that, leave the room, and come back, the cutscene goes to play again, even if the man I killed isn't there to talk.) I do hope you take my recommendation for more random events as the game occurs. Even if the game can go quickly, it could at least be spontaneous. If someone were to play the game on a joypad that had the directional buttons assigned on turbo, the game becomes pretty broken. Even if it is just emulated by just rapidly tapping the buttons instead of holding down it can still work. You move at 2/3rd the speed of normal walking, but you don't make any noise -- even in water. I would've never thought true stealth was so caffeinated and spazzy in nature! I see... Actually we came up with this as a solution for something we'd like the game to have. One of our goals was to provide means for the game to be beaten through action means and some more slow paced means, and for this one we added (it's not quite complete as you noticed) an investigation branch. This branch will have more puzzles and somethings you'd have to find out by listening to people talking and investigating (by using the space button mechanic) stuff. The dial thing is supposed to be a magical seal that the summoned set up to lock some boxes, containing more information and other stuff (we still don't have these assets). And sometimes you'll have to carry small objects to other places so that some things might work. We thought about a missing element or filter to complete the alchemic puzzle and some magic word (in this case you don't "carry", but you have to find out) to activate an extra dial on later dial puzzles. As for the bug of silent running we'll fix it. It happens because the sound of the footstep only starts on a specific frame, and I changed the character run speed and forgot to rearrange this. I'll see if I can take a page from Pandara's notebook and record a video which will recapture my 8 minute speed run. Just so you know, if you cure the silent running bug, it'll increase the speed run by at least 10 minutes because speeding certain rooms just won't be possible anymore. This will bring the game to around 20, but it might still be a bit fast. Also, if you open invisible doors, you can then chase frightened NPCs through them. They'll be quite content to just run all the way outside of the bounding box. Any game can be speed ran but, I actually feel this is more due to the fact that even if not sneaking guards have a short detection range, I really never felt "at risk" of dying. I played for about an hour and I really like what I've played so far. Submitted the questionnaire hopefully my feedback helps. MW and Pandara, this week I've fixed the guard's contact distance (maybe now it's too short and they touch you very often, but we'll se the optimum soon), now even if you run and start sneaking it's more dangerous do avoid them. And, since they're facing an invisible creature and they know it, they'll do some blind attacks at random after they give chase and find nothing. Also the sound of steps were re-synced. It might still happen, but not as easy as before. I actually reran the game just now to see if I could find other bugs, fixing the gaurds is perfect to prevent such speed running...(oh and I had a cool idea, make the ninja guards throw things much like the traps or give the different guards different combat traits). Anyways, here are the bugs I found. 1. Pressing escape during a cutscene causes the cutscene to end but the camera doesn't move back to the character unless you wait it out. you'll be standing on a safe plate though it'll shoot anyways because you are just slightly off, though your character model looks dead on, so it confused me which plates were correct. Yes in the old state you can power run the game extremely quickly, here is a short example of me power running to the first kill(TAKING A PAGE FROM MY OWN BOOK XD <3<3<3). It would be cool if they could throw some smoke bombs to get you dirty, but would be the same problem as the crossbow guards. 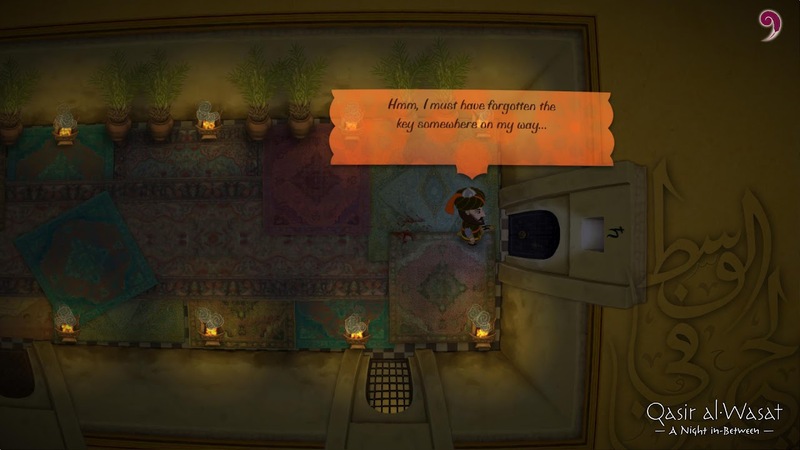 We were having lots of problems with the cutscenes (including this one) so we decided to make the cutscenes not skippable (since they're short and there are only a few) and you would have control over all the text by pressing space to advance your text and also the npc text. This is something I wasn't aware of. I'll tell the others tomorrow and see if we can come up with a solution. Does it happen very often? I think I'll make and upload another build now, since we made lots of changes already, then I'll make another by the weekend. About 1 out of 4 deaths. I want it, tell me when it's up and I'll play it through and tell you how it all feels/what bugs there are. =] what version number will it be? I'm uploading it to the server and will post a list of what has changed (that I know and can remember). Some of the things you pointed and suggested are still being worked on, some we unfortunately won't be able to do, and some will be done later. - The room with the civilian holding a key is acting strange. The civilian spots the key and the alarm goes off, then the guard spots the key (on the civilian) and tries to get it. - Sometimes some civilians (not all of them, to be more odd) won't animate. They will act normal, but frozen. Your help is being great! Thanks! 1. The starting cutscene of you being summoned doesn't play at the start. 2. Dying in the first room causes a cutscene of me being summoned to play. 5. The guards when startled by your foot prints act confused. they seem to get alarmed but don't actually investigate...then you stop moving and they act like nothing happened, pretty clear in the room after the first water pool with the two covered up guards in the courtyard. 7. If you die versus the guards past the smoke trap/ink room you re spawn at the water pool, it's only annoying because you have to wait for the ink/smoke switches to turn off multiple time before trying against the guards again. 9. I found the poison and instantly b-lined for the giant dish to examine...and seeing the syringe and the guy talking about poison before in the first cutscene, then the follow up of fruit being removed from the plate + the message was PERFECT, nailed it. 11. I swear I got hit once and then 1/4 a second after he hit me before I swiped...resulting in him dying and me being alive. Check to see if the animation is in sync with the actual hit. 12. I feel like blood detection just feels weird now compared to the aped up sound detection, I have stage 1 blood, and it's actually better to sneak 5 feet from a guard with lvl 1 blood on my face, then get in the water up to 40 feet away from the guards, because they instantly find me from the splash effect. I like that the game feels harder from the new detection... I just I felt disconnected from the game, blood detection should be amped up a little as well maybe. To keep it balanced. 14. Pressing the switch hidden in the giant censor, then going back to the previous room causes the game no clip you while turning you invisible breaking the game. The game froze here for me and I'll of course play through again when I wake up tomorrow, but it's past my own self given bed time =]. It's listed to do this week (with the possibility of being implemented first on the main menu and then on he pause menu). I think it should be alright now! Nice! I (hope) think it would be easier to solve the new problems. This seems to be the same problem with the guard. I'll check on it today. The save points only check when you leave some doors (usually every door on the rooms with save points), but I removed the one on the top door so that if someone fall to the traps the game wouldn't save right after it. Anyways I've put another save point between the bottom door and the first trap. This might have something to do with the reverb zones... You don't know how many times I've told our sound designer (back then when we took sound design classes together) not to use so many and strong reverbs... I hope we can have the help of a friend that is an outstanding professional sound designer to do the mastering of everything in the game. Anyway, I know this problem exists, butcould you record it happening? We tried reproducing it but it never happened as you said. Since we changed the speeds we haven't remebered to resync the guard attack animation. Should be done soon. Might be some level design problem. I'll check on it. I actually tried to recreate it, and failed...but this leads me to think of something different...you'll see in the video the cracking happens 1. when the guards are following me and 2. even with no guards around stepping through the water in that location also causes the problems. Maybe this and that problem are connected? like it's trying to play both the water stepping sound and/or the floor stepping sound? breaking the sound? anyways the video is uploading it's only 5:30 long so should be up quickly! Since the room with the final target is still bugged I didn't manage to trigger any of the endings. I get the feeling that the intent is you get a boring ending if you just kill the three and don't do any optional stuff in the blue rooms and mysterious gardens -- at least that is the impression I got from the protagonist's extra monologue after the first kill. If that's the case, I do hope your story writer does implement the "until dawn" suggestion I recommended. The thing about having such different endings is that after a while you simply have no reason not to go for the best one on subsequent playthroughs. (When was the last time you didn't do a Ballos Run in a Cave Story?) Making doing anything optional in the game risky to other goals would help to offset this. I did, however, try to mess around a little bit more and I managed to make a bug after warping into a Blue Room I'm not sure I was supposed to get to. It was a room with around six guards in it. Since I was 100% visible, I tried rushing it and I almost made it. However, I was killed at the exact same moment the warping was in effect, when I respawned I could no longer move, and that's what ended my first playthrough on this version. Now that I think I understand some of the intrigue behind the blue rooms, they don't bother me as much even through the glitches. But I still kind of think they are just more boring in comparison to the rest of the palace. Even the confused mess that is the Warp Zone is just more interesting to play when compared to a series of warp-pad hallways where nothing of note happens and all you do is get lost. The place having no guards or enemies really takes away from the amount of fun those areas offer. I'll report on more on my next few playthroughs. Hm... we have to see about it. I think we had seen it happen once loong ago. Seems like it was a forgotten bug that has to be fixed. Edit: Seems like this bug is fixed. Now when the game freezes your character right before the teleport occrurs you also become invincible. 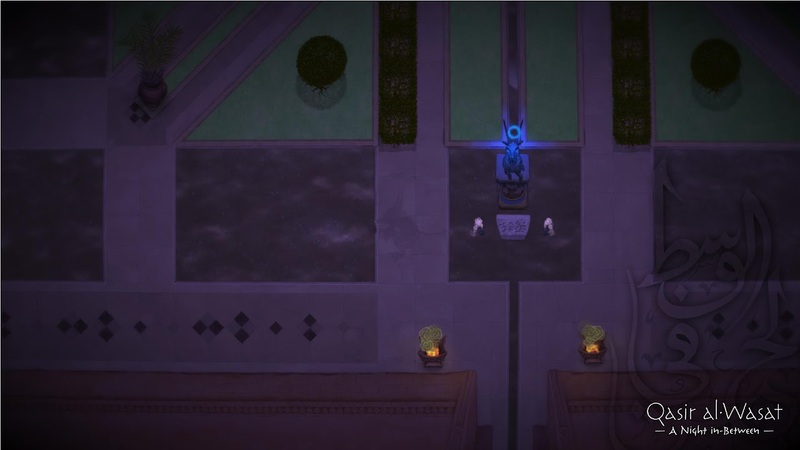 You're right about the regular ending over the best one, which involves the blue rooms and the central garden. I told our artist (since he's the one that's used to configure the lights properly) and he really liked the idea of changing the lights of the game according to events, probably after each target is killed, so that the game goes until dawn if you go for the best ending and almost dawn if not. I think narrative can adapt to this concept too. The blue room with the guards is connect to the room before, with the prisoners (it hasn't been made clear by the content yet). It's like if their souls was connected (if you execute one of the prisoners the corresponding guard on the next room will die too). Also we'll have more narrative bits (that first cutscene, for instance, shows like the ghosts of the past... that whole are is something about a place that got stuck in time back on the time the sorcerer took over the palace) going on there and lots of special props (and we're thinking that since the rooms that change are like the same place in a different plane, each version would have different content). Do you think that adding a bit of action would improve the general feel of that areas? I fixed this problem with the door leading you to nowhere in the previous room. There were two doors with the same id on the previous room. It's fine now. Our sound designer is aware of the audio issue. Hope Unity has some easy way to make a cap on the reverbs (we're using Unity's dynamic sound effects instead of designing every variation).